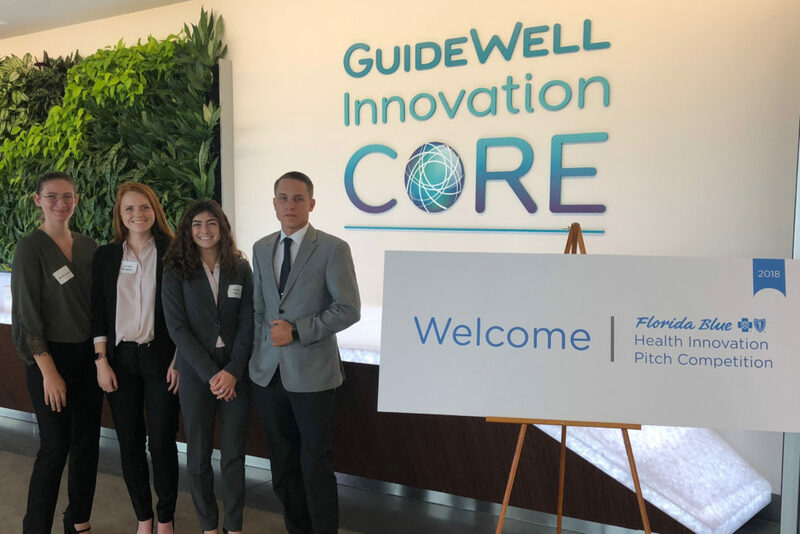 Shelby Garner, Jordan Douglass, Chelsea Reeves, and Michael Jernigan (from left) are four of the six Florida Polytechnic University students who presented projects at the Florida Blue Health Innovation Competition in October 2018. 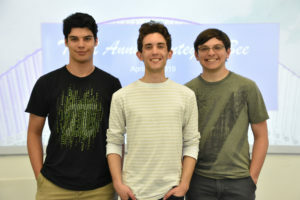 Douglas, Reeves, and Jernigan placed third for their cloud-based platform called SynapCare. The team of Jordan Douglass, Michael Jernigan and Chelsea Reeves won third place with SynapCare, a cloud-based platform designed to track a user’s brain waves to make detection and monitoring of mental illness readily available to both patients and mental health professionals. “With the struggle of mental illness being so prevalent in today’s society, working with a team so passionate about improving the lives of others is extremely rewarding,” said Reeves, a junior electrical engineering major from Jacksonville, Florida. Douglass is a junior advanced technology/data science major from Lakeland, Florida, while Jernigan, also a junior, is from Auburndale, Florida, and majoring in electrical engineering. “With the growing number of people suffering from depression, early prediction, detection, and ongoing monitoring is extremely important in my mind,” said Jernigan. 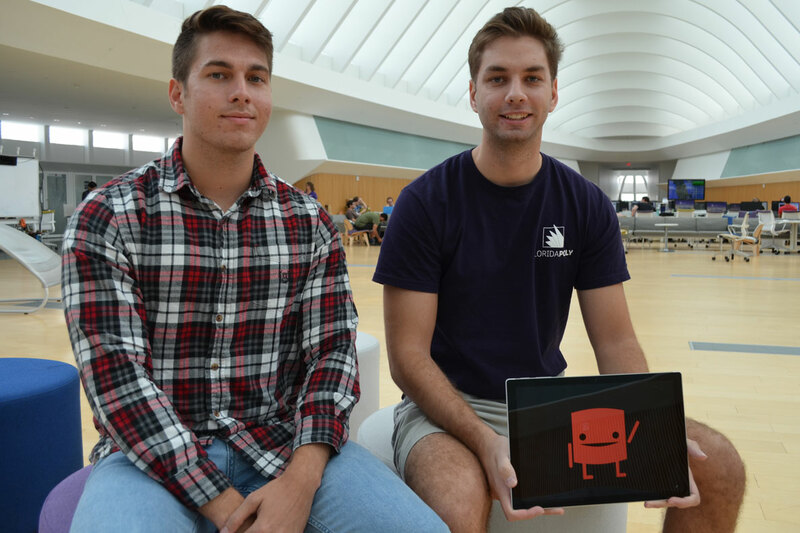 Andre Ripley, left, and Brady Fishel, both seniors at Florida Polytechnic University, show the design of Chip, who is the face of a digital platform they have created called Empathy. Empathy uses artificial intelligence to improve mental health. Brady Fishel and Andre Ripley also pitched their concept at the competition. Project Empathy features a “digital friend” named Chip, who is a chatbot that interacts through text messaging. As the user inputs information about their feelings and emotions, Chip learns about the user and provides positive interactions. While Fishel and Ripley stress that Empathy is still very early in development and will never replace medication or therapy, they hope it can help users overcome the stigma sometimes associated with reaching out for help to treat depression. “Just to provide some extra assistance to help improve someone’s life is a major step for a lot of people,” said Ripley, a senior from the U.S. Virgin Islands majoring in computer engineering. Some of the ways in which Empathy would help include checking in with the user on a regular basis, asking how an exam went, and even asking how the user feels on a scale of 1-10 and tracking the user’s progress. 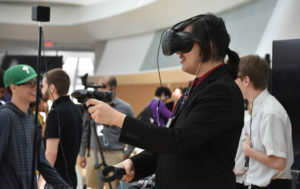 “It will be an additional outlet to help you keep your life together,” said Fishel, a senior from Lake Mary, Florida, majoring in computer science. Shelby Garner also was a finalist with a mental health management mobile application for patients and providers. Garner is a sophomore from Beverly Hills, Florida, majoring in computer science. All three teams received $1,000 as finalists while Douglass, Jernigan, and Reeves received an additional $2,500 for finishing in third place. 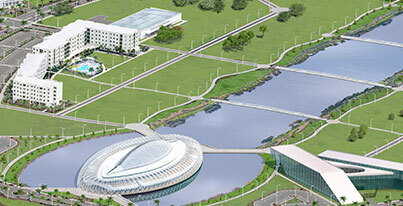 During the past two years, Florida Poly students have won more than $35,000 for their entrepreneurial ideas and have placed in eight of 10 competitions they have competed in across the state.